Make way for the Season 2 of Magsasaka TV, a program empowering the cause and livelihood of farmers in the Philippines, to broadcast soon on one of the leading local networks. DV Boer Farm head Dex Villamin with songwriting icon Gary Granada team up for the cause of Magsasaka TV. Previously airing on PTV-4, the coming Season ensures a wide reach and mainstream approach in delivering a show embracing agribusiness and tourism through the immense possibilities and power of farming. 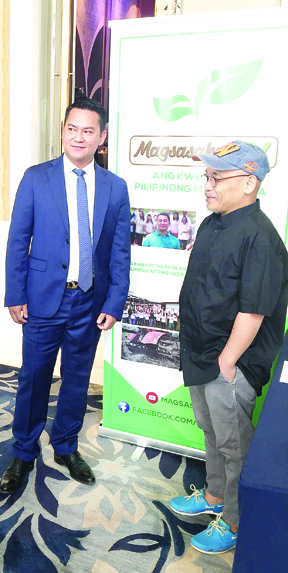 Magsasaka TV, which was launched last month at the Grand Ballroom B of Shangrila At The Fort, boasts a new format and treatment that emphasize further the beauty and sense of its entrepreneurial and social advocacies. The popular tune is penned and lent for Magsasaka TV’s cause by the iconic singer-songwriter Gary Granada. Voices from the ever-growing and now-empowered Filipino farming community warmly interpret the now-classic track from the same talent who wrote the Metropop winner “Mabuti Pa Sila” and that unforgettable Ginebra fan anthem that both came out in the late ‘90s. Through Magsasaka TV, DV (as how Dex Villamin is fondly called by people familiar with his advocacies and initiatives) and his team of dedicated professionals take televiewers and radio listeners to various places and faces in vast farmlands all over the country. It also serves as a vehicle in sharing and showing the developments taking place in modern farming corporation DV Boer Farm International that practically spearheads the program through its sub-company, Magsasaka Inc. Allow DV and his farming associates to expound on the background, current status, and future plans of DV Boer and its fast-increasing number of sub-farms, and Magsasaka Inc. Hear also their take on “Tagumpay Nating Lahat” which perfectly voices out the inspiring vision of their advocacies for the Filipino community and OFWs eyeing for jobs and livelihood to keep them happily home for good. Magsasaka TV began as a result of DV’s hope of reaching more Filipinos to educate them even more on the great potential of farming for self-sustaining communities, providing livelihood to alleviate poverty among the underprivileged, and empowering OFWs and all individuals with entrepreneurial spirit towards the fundamentals and several benefits of farming. It is the culmination of his journey from a high school drop out with innate abilities to excel, to becoming a pastry chef hailed by hotels here and in Thailand where he became a celebrity pastry chef, and to modernizing farming in the country through corporate-savvy policies and results-oriented processes.